Thursday, Congresswoman Nancy Pelosi reclaimed the speaker’s gavel, the 78-year-old congresswoman from California, is now the Speaker of the House. The team here at Townhall reported extensively on the topic, both her becoming Speaker of The House and President Trump's reaction. 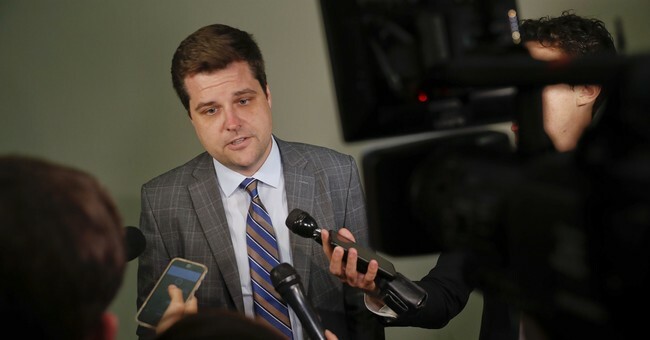 In her honor, Congressman Matt Gaetz (R-FL) wasted no time in aiming for Speaker Pelosi by releasing a video of her "greatest gaffes." “Please God, let Nancy Pelosi continue to be the voice of the Democratic party," the video begins with the former Arkansas Governor Mike Huckabee stating. Then the mistakes in word choices and slip-ups begin as it shows Pelosi referring to President Trump as President Bush while Congresswoman Maxine Waters (D-CA) is in the background with her eyes popping out of her head and dropping her jaw at Pelosi's slip-up. That says a lot because we already know Rep. Waters has a few screws loose herself. Then Pelosi states the Affordable Care Act is “affordable”...12 times. Pelosi has a record of calling the bonuses which employees were distributed from corporations after the passage of the Tax Cuts and Jobs Act, "crumbs" and "so pathetic." Many in her party have joined her in making similar statements. She has also made claims before with fellow Democrats that tax cuts are nothing more than a "GOP tax scam" - this was also a significant talking point for the Democratic Party in the 2018 midterm elections. The next "greatest gaffe" was Nancy Pelosi stating that “We have to pass the bill, so you can find out what is in it” while speaking about the Affordable Care Act. The now Speaker Pelosi missed the mark here as anyone can read the draft of the bill including the average American citizen. The tweet from the Florida Congressman reads, "In honor of our new @SpeakerPelosi, here are some of her "greatest" gaffes: #116thCongress #SpeakerPelosi"
Congressman Gaetz, Friday afternoon faced backlash over his statement on the show Outnumbered on Fox News when speaking about how Sen. Warren is "making her way from the eastern seaboard into the center of the country, maybe Sacajawea would be more appropriate," in reference to her 2020 run for president. Then, CNBC White House Correspondent Christina Wilkie asked Walter Shaub, former Director of the U.S. Office of Government Ethics if any violations had occurred by Gaetz going on the show.